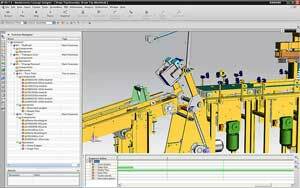 Design software is a powerful tool for facilitating the overall design of complex motion control products or systems. This software can test and validate various designs in a virtual environment without the purchase or installation of actual equipment. Design software can include features such as program planning and requirements, system engineering, CAD (computer aided design), CAM (computer aided manufacturing, CAE (computer aided engineering), lifecycle management, product configuration, manufacturing and/or factory planning and simulation, and closed-loop verification. Analysis software helps engineers understand how a material, component or product assembly reacts under stress, vibration or other factors and is essential to effective design. Analysis software can include features such as finite element analysis (FEA), structural analysis, simulation, linear and nonlinear analysis, structural dynamics, durability and fatigue analysis, noise, vibration and harshness analysis and composites analysis.